snowdeal.org > ex machina: the postcard project: boston, massachusetts. 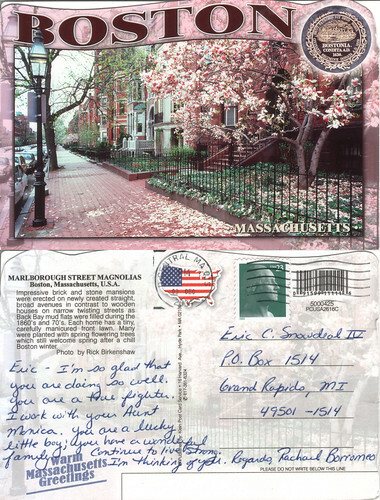 the postcard project: boston, massachusetts. a co-worker of auntie m's sent this postcard of boston's lovely marlborough street magnolias. rumour has it that auntie m has ( had? ) quite a collection of pictures up at work and more than a few officemates have taken a an interest in odin's adventures.